Enjoy this high quality Falling Fruit Live Wallpaper. 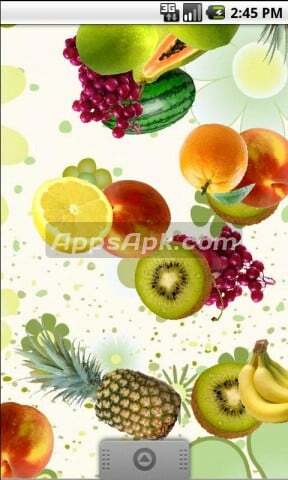 Watch as a huge variety of fruits continuously fall across your background. This beautiful looking wallpaper runs extremely smooth and uses minimal battery life. With highly customizable settings and 10 amazing backgrounds to choose from, the high quality of this wallpaper will defiantly keep you using it for a long time. If you liked this wallpaper, please purchase the donation version to help support development. If you have any suggestions for new themes please feel free to contact me and I’ll be sure to develop live wallpapers for it as quickly as possible. With 14 different kinds of fruits and 10 background images, this is a highly customizable wallpaper including abilities to select the falling speed and the amount of fruits falling. The behavior of the fruits are highly randomized, including varying rotating speeds, differences in falling speeds and random locations to appear on top of the screen. As always, feedback is welcome and appreciated as I intend to provide quality applications. On a further note, if you would like to see any new particular live wallpaper or application in general created, please feel fee to contact me as I’m always looking to develop new apps.